In Header top bar option, you can select background color, font color and header top bar items. Header Top Bar Height: Choose increase or decrease header top bar height. Header Top Bar Sticky Height: Choose increase or decrease header top bar sticky height. Header Top Bar Skin: Choose your individual skin setting for header top bar. 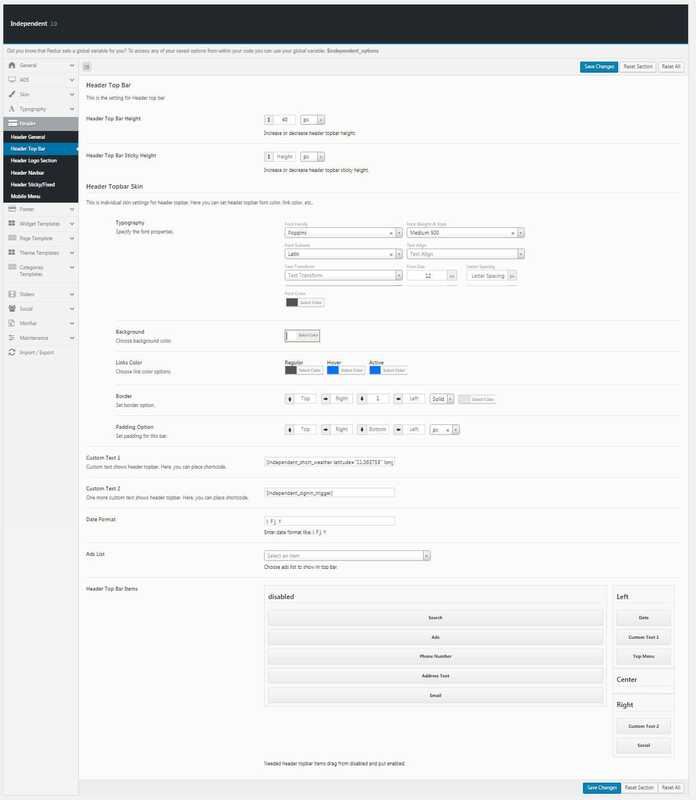 You can set top bar like typography, background color, link color options, border option, and padding option. Custom Text 1 and 2: Enter your custom text to show on header top bar. (You can enter short codes). Date Format: Enter your date format like l, F j, Y. Ads List: Select your ads list to show in top bar. Header Top Bar Items: You can drag and drop which items you want to show left/center or right part from disabled part. Site not shows which top bar items are in disabled part. Available top bar items are, custom text, top bar menu, search, social, ads, phone number, address text, and email.